HolIgor: I think it is important to explain to weaker players why was bad. The problem is the balance of weak groups. After at aWhite's group is settled and thick without worries. Moreover, it has an exit to the center. 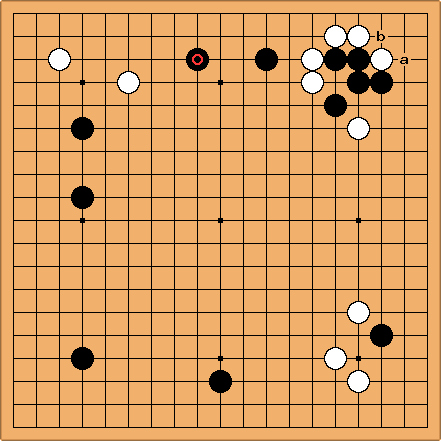 Black's groups at both sides are weak and can come under attack. This attack will give White a possibility to obtain many useful stones at the places of White's own choosing. On the other hand, should Black deny an easy settlement to White stones the lone black stone on the upper side would be safe. White would be afraid to strengthen it since a rash attack could put White's stones in danger. Charles I've added a page about settled and unsettled. Probably for a 'rule of thumb' one should use the base concept as a mid-point: ask the questions 'does this group have a base?' and then 'is the base large enough for two eyes?'. (If a group needs eyes in two separate places it is probably already weak.) The etymology of joseki isn't helpful here. Charles One can think of it this way. White's plan is developing on both sides. But Black can take a 'soft' attitude to it, provided the black corner is definitely alive. Arno: just to illustrate the point: Black could play then run into the center with . White's group looks very weak now. That's why is doubtful. unkx80: Sorry for neglecting to put comments, as I made the move at about 2 am in the morning. Anyway, as HolIgor said, after , the black group in the corner has a root (eye space) and is safe but the white group has no root and will get attacked. Without the stone at a, White will feel reluctant to play the attachment at b as it will strengthen the weak lone stone. Also notice that the position of the marked black stone is excellent: it makes injuring the white group at the top and injuring the white marked stone somewhat miai. For example, if White chooses to play at c to escape, Black will naturally play at d to attack the White group and injure the white marked stone at the same time. It is in a wider sense, a natural "flow" of the game. DaveSigaty: The other thing to remember about this type of play in the corner is that a White connection at 4 (alternatively a White play at 3 if Black doesn't force) sets up the play at 6 which connects and makes an eye in the corner. Pushing immediately at 7 forces Black to settle the shape in the corner. In this game with the weak Black stone to the left, it seems worth trying to look for the right opportunity to connect. Bill: What is the point of ? Charles Yes, now isn't a good time. This is one for my forcing move misunderstandings page. This peep might be valid at a time when Black really must make eyes on the side. Before then, you can say: White will not hurry to play at ; playing it makes Black at b less effective; playing it gives up an endgame move at c that Black may find very useful against White at d. All in all, this peep is a bit heavy.